Spring has finally sprung and this Pistachio Pineapple Cake is the perfect way to welcome it…FINALLY! Hi there Hoosier Homemade fans! I’m super excited and thrilled to introduce you to Maria from Real Life Dinner. Maria has joined our team and will be sharing delicious, easy to make recipes with you. Today she has a yummy Pistachio Pineapple Cake that is perfect for Easter and Spring – really anytime! I can’t wait to give it a try! Pistachio and pineapple may seem like an unlikely pair, but if you’ve ever had Watergate Salad you know that is not true. They perfectly compliment each other. 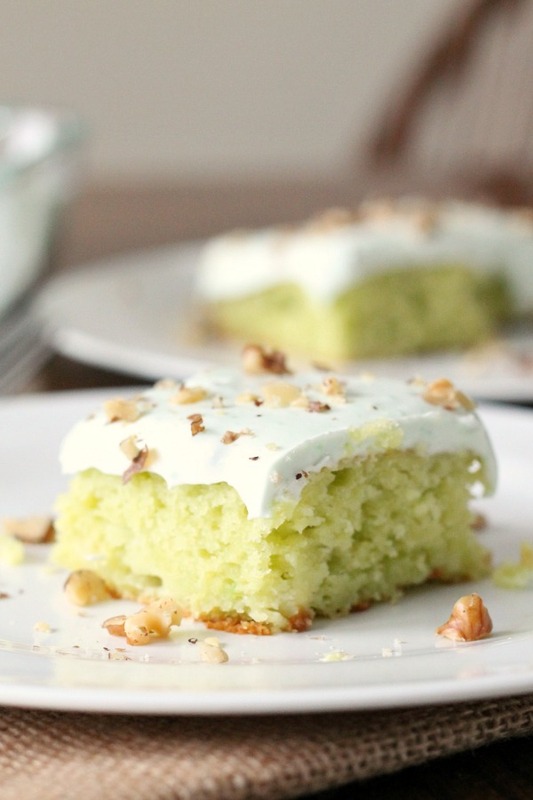 The pineapple and pistachio pudding mix add incredible moisture to the cake and the whipped topping pistachio frosting is the perfect amount of creamy goodness to balance out this pretty cake. As a busy mom I love recipes that are made from ingredients I can keep on hand in my pantry and freezer. This Cake fits that bill and, even better, only takes minutes to mix up. Pistachio Pineapple Cake is the perfect quick dessert for those days when you just want to be your family’s hero and it’s equally perfect for potlucks, spring holidays and basically any other excuse you can find to bake and eat cake. So, I didn’t put it in the ingredients photo but, I have a little secret ingredient I like to add to the frosting when I’m feeling crazy, which is basically all the time…..
I’m a pretty big fan of the little zip a spoonful of sour cream can give to dairy based dessert…If you don’t believe me try my favorite Coconut Cream Pie Recipe or my Amazing Fresh Strawberry Pie Recipe and you’ll be a believer in no time! Find Maria on her blog, Real Life Dinner. Follow her on Pinterest, Facebook, Instagram and Twitter. Delicious and moist cake made with just 5 ingredients and topped with a creamy frosting. Using a stand mixer or a hand mixer, mix cake on medium speed for approximately 2 minutes. Pour batter into greased 9x13 pan and Bake at 350 for 30-35 minutes or until a toothpick comes out clean. Combine milk and pudding mix in a medium sized mixing bowl. (if you are going to get crazy and add some sour cream, this is the time to do it. Just a spoonful approx. 2-3 tbsp) Whisk for 1-2 minutes and let stand for 4-5 minutes. 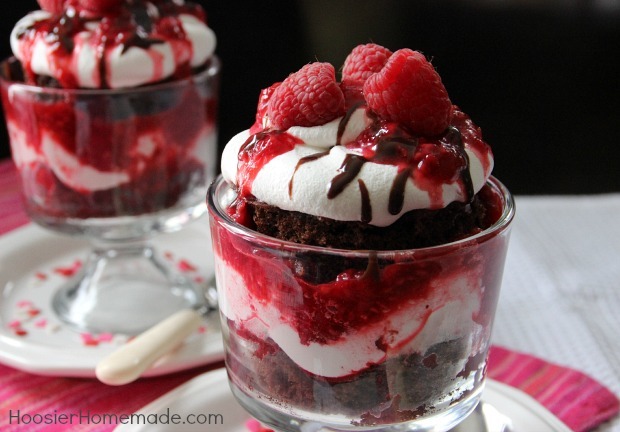 Gently fold in the whipped topping and spread creamy pudding frosting evenly over cake. Sprinkle with chopped nuts if desired. Refrigerate until you serve it. Note: If your kids will freak out at the site of a small pineapple chunk, blend the pineapple up in your blender before mixing into the cake. do you make up the whipped topping – or just add the dry whipped topping to the pudding? Hi Midge, the whipped topping is for the frosting. You can see a picture of the ingredients. It’s a tub of whipping topping, and then fold it into the pudding mixture. Hi Barbara, I’m sorry I don’t understand your question. The pudding is added to the cake mix, dry, not mixed with milk. And the pineapple is not drained. 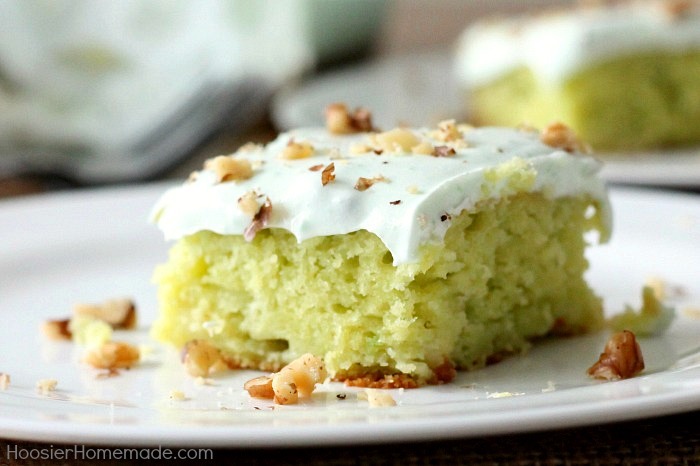 I used to make a pistachio and pineapple dessert & it was delish, so would like to try this cake. 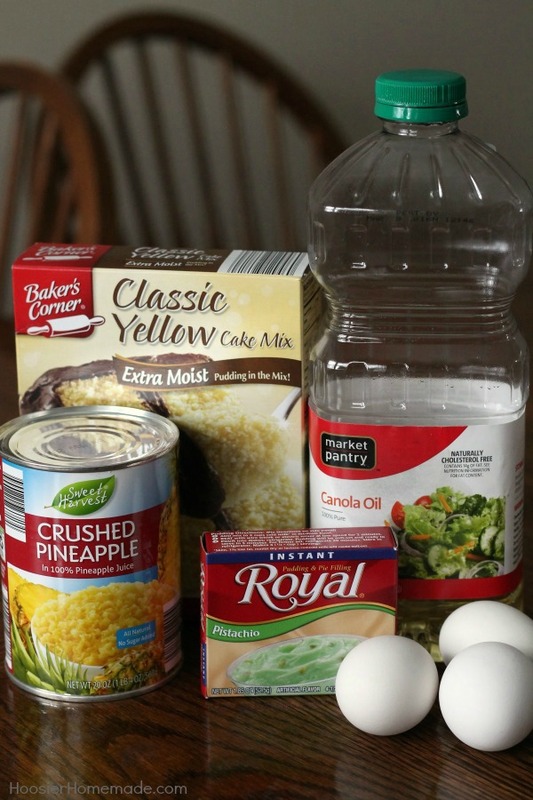 Questions: (1) The crushed pineapple – do you drain it or leave the juice in? 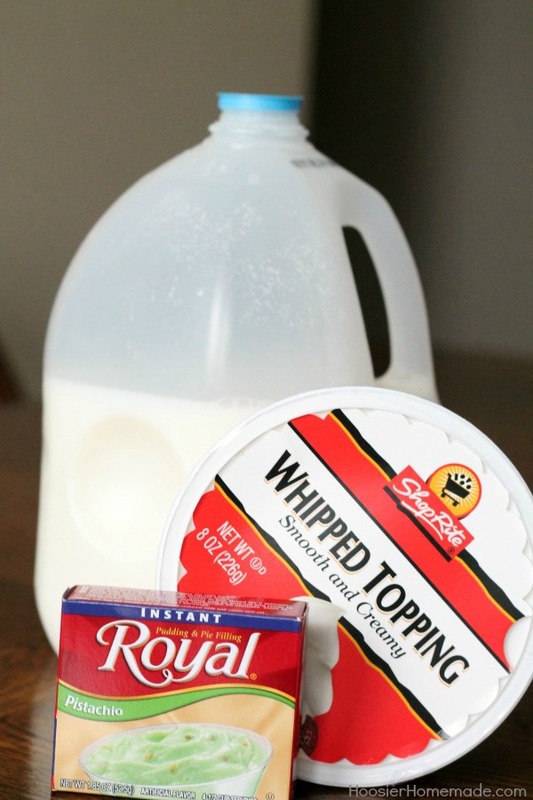 ; (2) ingredients say just a spoonful of sour cream, but then it says 2-3 tablespoons. ??? Hi Tavette, you do not need to drain the pineapple, and yes you are correct, 2-3 tablespoons sour cream.